This painting is a sample of what the beginning students will learn at an ongoing workshop scheduled for March, July, and November 2008 at The Artist's Nook in Fort Collins CO. 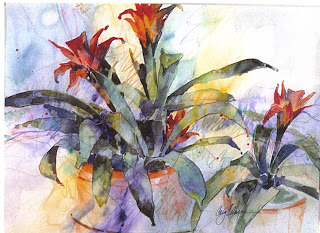 This easy method was developed for the novice student though seasoned artist's are welcome. The student, with lots of student/teacher interaction will develop skills and design, learn from evaluations, and discover a personal style. For information contact artistsnook@comcast.net or artwithmoxie@cox.net .